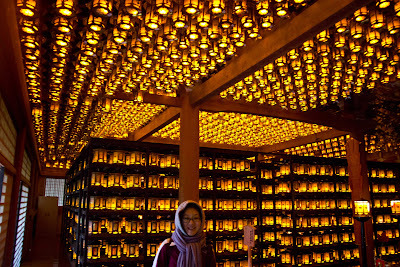 Another early morning start watching the monks pray at 6:30. Then a vegetarian breakfast served in our room. We headed out to explore. 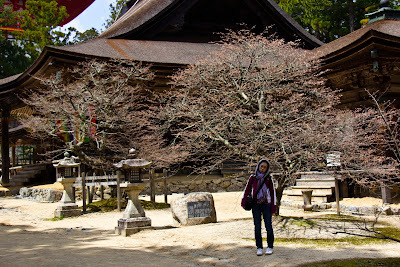 Koyasan is a world heritage site full of temple lodgings and old stuff. 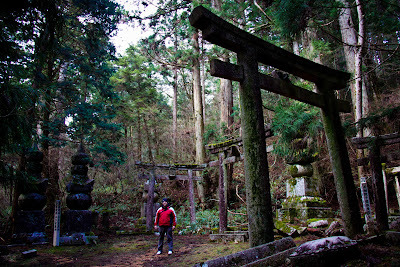 It was a really neat place. 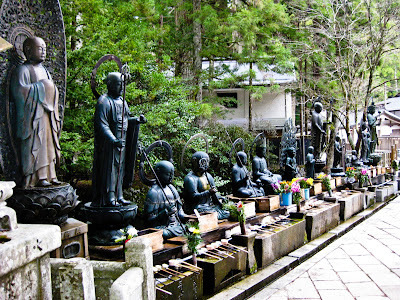 You could be wandering around and then stumble on a massive temple. Many a time I remarked to Chris, Here be Giants! 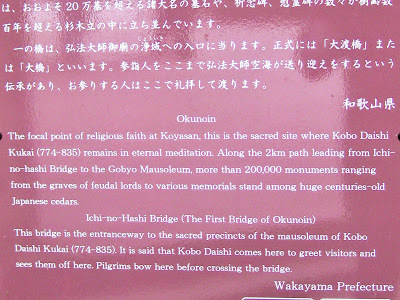 Our favourite part was our walk to Okunoin. 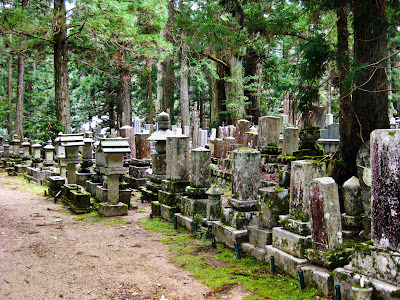 At this site is Kobo Daishi's mausoleum. 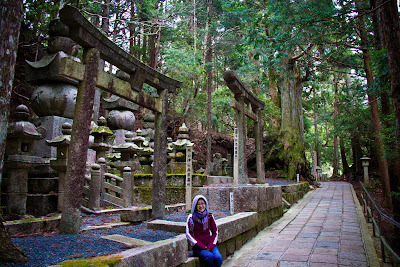 Along the ~2km path leading to it you cross 3 bridges and there are over 200,000 monuments and memorials as everyone wanted to be part of the pilgrimage route to okunoin. 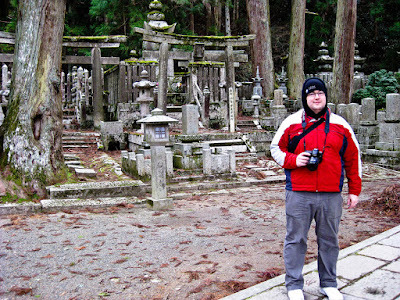 It was also really quiet when Chris and I went there at 7:30 in the morning! While we were there it even started to snow a little! 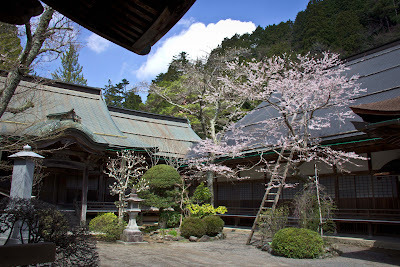 The cherry blossoms at Koyasan were just beginning to bloom. It would be even more spectacular if we had gone a week later. Too early for cherry blossoms! 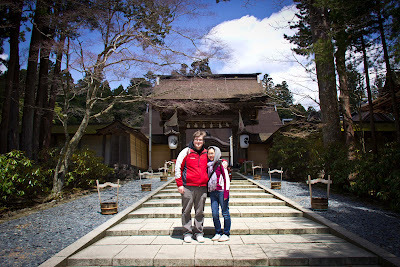 We could have spent a lot more time on Koyasan, but had to make it to Hiroshima in the evening so we headed off to catch the cablecar back down the mountain. 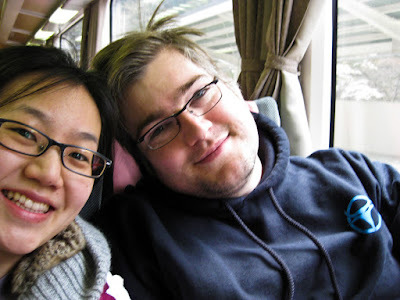 We got caught up in all the sights, we missed the bus to the cable car by minutes. Thankfully a taxi had just dropped some people off at the temple across the road and we took it to the cablecar, bought tickets for the train, caught the cablecar and then the train all with only a few seconds to spare! Phewf. That was a close one! Glad we caught the train. We made it to Hiroshima for the evening, walked outside the train station and there was our hotel. After sleeping on the floor for two nights in the mountains in ryokans with no insulation, we arrived to a massive room at the Sheraton with a massive soft bed for a fraction of the price of the ryokans, hah! 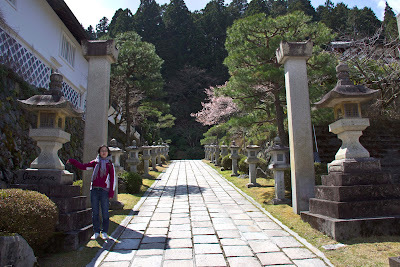 This entry was posted by Lianne on Friday, April 12. 2013 at 21:19. and is filed under Japan. You can leave a response, or trackback from your own blog. My weblog is proudly powered by Serendipity 1.7.8.